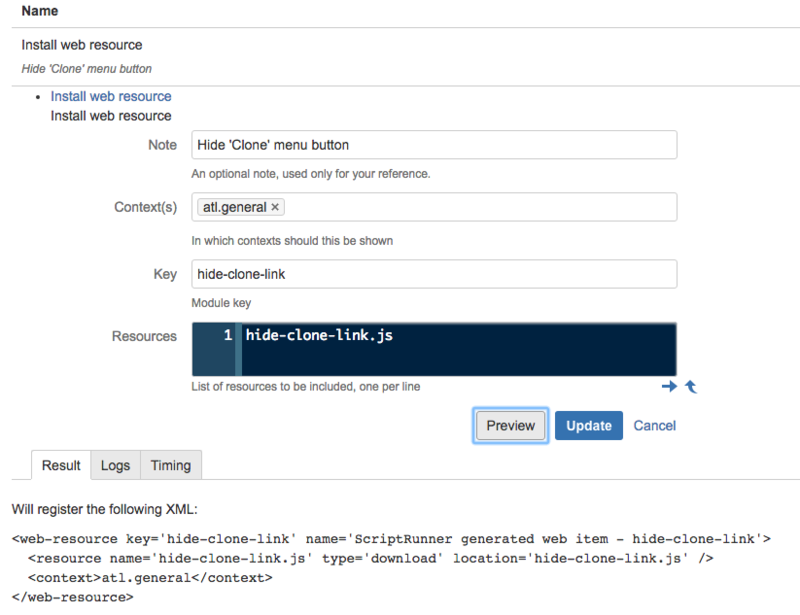 Copy and paste the content in a text editor and save it as hide-clone-link.js under <app.home>/scripts or under one of the directories you have defined in plugin.resource.directories. 2 I am using a project key "JRA" for this example. You need to change the key according to one of your preferred project key. 3 Get the project key from the issue key. 4 Hide the anchor with class "clone-issue" if condition satisfies. Clicking Preview should show you a valid result. In case of error make sure then file name and provided "Resources" name is same. That’s all. The "Clone" button should be invisible for all the issues in project with key "JRA" after refreshing.